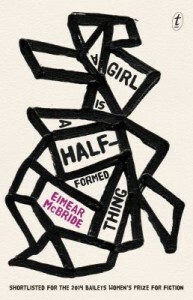 The Irish writer Eimear McBride has won the Baileys book prize for her first novel, A Girl is a Half-formed Thing. McBride’s dark family tale, written in the hurtling, comma-free voice of an unnamed narrator, won over the judges of the women’s prize for fiction, formerly the Orange prize. McBride had accumulated a hefty pile of rejection slips, and the manuscript had gone into the back of a drawer, when a conversation between her theatre director husband and a bookshop owner in their adopted home city, Norwich, led to its becoming one of the launch titles of the small independent press Galley Beggar. an unconscious railing against a life that makes little sense.